Trauma can be defined as a bodily and/or mental injury caused by an external agent. When a person encounters a traumatic experience, he/she becomes an injured person that suffers from physical and emotional wounds. 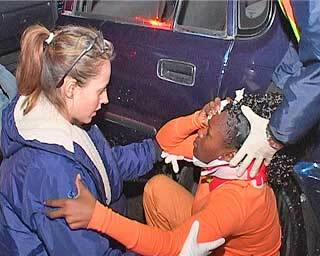 The word “Trauma” is derived from the Greek word meaning “wound”. Most people will experience a trauma at some point in their lives, and as a result, some will experience debilitating symptoms that interfere with daily life. Motor vehicle accidents are considered the leading cause of posttraumatic stress disorder (PTSD) in the general population and car accidents are the number one trauma for men and the second most frequent trauma for women. Anyone can become traumatized. Even professionals, who work with trauma, or other people close to a traumatized person, can develop symptoms of "vicarious" or "secondary" traumatization. Posttraumatic Stress Disorder (PTSD) is an anxiety disorder that can develop after exposure to a terrifying event or ordeal in which grave physical harm occurred or was threatened. Motor vehicle accidents are perhaps the most common trauma experienced by individuals. What is emotional or psychological trauma? Psychological trauma is a type of damage to the psyche that occurs as a result of a traumatic event. When that trauma leads to Post Traumatic Stress Disorder, damage can be measured in physical changes inside the brain and to brain chemistry, which affect the person's ability to cope with stress. A traumatic event involves a single experience, or an enduring or repeating event or events that completely overwhelm the individual's ability to cope or integrate the ideas and emotions involved with that experience. The sense of being overwhelmed can be delayed by weeks or years, as the person struggles to cope with the immediate However, different people will react differently to similar events. One person may perceive an event to be traumatic that another may not, and not all people who experience a traumatic event will become psychologically traumatized. It is not the event that determines whether something is traumatic to someone, but the individual's experience of the event. And it is not predictable how a given person will react to a particular event. For someone who is used to being in control of emotions and events, it may be surprising - even embarrassing - to discover that something like an accident or job loss can be so debilitating. What is the difference between stress and emotional or psychological trauma? If we can communicate our distress to people who care about us and can respond adequately, and if we return to a state of equilibrium following a stressful event, we are in the realm of stress. If we become frozen in a state of active emotional intensity, we are experiencing an emotional trauma—even though sometimes we may not be consciously aware of the level of distress we are experiencing. With the development of brain scan technology, scientists can now observe and reveal that trauma actually changes the structure and function of the brain, at the point where the frontal cortex, the emotional brain and the survival brain converge. 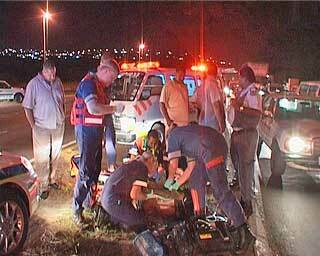 What are the symptoms of emotional trauma experienced by accident victims? It is important to note that developing symptoms is never a sign of weakness. People who go through traumatic experiences often have certain symptoms and problems afterwards. How severe these symptoms depend on the person, the type of trauma involved, and the emotional support they receive from others. Reactions to and symptoms of trauma can be wide and varied, and differ in severity from person to person. A traumatized individual may experience one or several of them. Sometimes these responses can be delayed, for months or even years after the event. Often people do not initially associate their symptoms with the precipitating trauma. hyper-vigilance, jumpiness, an extreme sense of being "on guard"
After a traumatic experience, a person may re-experience the trauma mentally and physically, hence avoiding trauma reminders, as this can be uncomfortable and even painful. They may turn to alcohol and/or drugs to try and escape the feelings. Re-experiencing symptoms are a sign that the body and mind are actively struggling to cope with the traumatic experience. Emotional triggers and cues act as reminders of the trauma and can cause anxiety and other associated emotions. Often the person can be completely unaware of what these triggers are. In many cases, this may lead a person suffering from traumatic disorders to engage in disruptive or self-destructive coping mechanisms, often without being fully aware of the nature or causes of their own actions. Consequently, intense feelings of anger may surface frequently, sometimes in very inappropriate or unexpected situations, as danger may always seem to be present. Upsetting memories such as images, thoughts, or flashbacks may haunt the person, and nightmares may be frequent. Insomnia may occur as lurking fears and insecurity keep the person vigilant and on the lookout for danger, both day and night. In time, emotional exhaustion may set in, leading to distraction, and clear thinking may be difficult or impossible. Emotional detachment, also known as dissociation or "numbing out", can frequently occur. Dissociating from the painful emotion includes numbing all emotion, and the person may seem emotionally flat, preoccupied or distant. The person can become confused in ordinary situations and have memory problems. Some traumatized people may feel permanently damaged when trauma symptoms don't go away and they don't believe their situation will improve. This can lead to feelings of despair, loss of self-esteem, and frequently depression. If important aspects of the person's self and world understanding have been violated, the person may call their own identity into question. These symptoms can lead to stress or anxiety disorders, or even post-traumatic stress disorder, where the person experiences flashbacks and re-experiences the emotion of the trauma as if it is actually happening. What if symptoms don't go away, or appear at a later time? Over time, even without professional treatment, symptoms of an emotional trauma generally subside, and normal daily functioning gradually returns. However, even after time has passed, sometimes the symptoms don't go away. Or they may appear to be gone, but surface again in another stressful situation. When a person's daily life functioning or life choices continue to be affected, a post-traumatic stress disorder may be the problem, requiring professional assistance. The good news is that psychological interventions are effective in preventing many long-term effects. Trauma Counseling is something best left in the hands of well-trained and experienced professionals. It is however important that we reflect on the “Human Needs Hierarchy” developed by Abraham Maslow, and consider the responses by “Helpers” to meet these needs. This will help us to better understand accident victims and to act responsibly around these victims and survivors. The immediate need for survivors is to survive the disaster. confirm the self-worth of survivors by validating them and by showing respect for the survivors’ losses. Accident victims need to transcend trauma - a process whereby a commitment is made to become conscious of one’s life and its impact on the universe. It has been said that we never get over the loss of anything that becomes part of us. help to find meaning and a place for the loss in the lives of accident victims - which is a more reasonable goal! Following traumatic events, persons involved are often asked to talk about the events soon after, sometimes even immediately after the event occurred in order to start a healing process. This practice may not garner the positive results needed to recover psychologically from a traumatic event. Victims of traumatic occurrences who were debriefed immediately after the event, in general, do fare better than others who received therapy at a later time. How can debriefings make things worse? 1 -Venting emotions and reviewing experiences repeatedly in the immediate aftermath of a crisis can interfere with victims' natural adaptive instinct to distance themselves emotionally. They may start ruminating about the event--fixating on why it happened, how life is now ruined, whether revenge is possible--thus intensifying intrusive memories and overall distress. 2- Debriefing might lead people to believe that they have now received "treatment" for distress and no longer need to, or should, disclose their anxieties to family and friends. This deprives victims of the comfort and reassurance that are usually best supplied through established, intimate relationships. Paradoxically, knowing that professional debriefers are involved may even cause family and friends to hang back. 3 -By warning participants of the kinds of reactions that could develop over the coming weeks, debriefers might inadvertently prime victims to interpret otherwise normal reactions as pathological or as the beginning stages of PTSD. As the psychiatrist, Simon Wessely has remarked, "The toxic effect of counselling is that some people begin to see themselves as having a mental health problem when they do not." Much attention, effort and funding have been focused on creating awareness of road safety. It is also important that we do not neglect the injured victims, survivors and the professionals who have to deal with trauma every day. 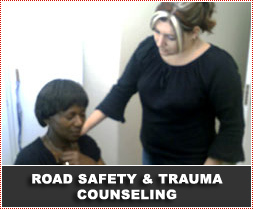 The Arrive Alive Road Safety website will commit towards providing information on trauma counselling to increase awareness of this important aspect of road safety.